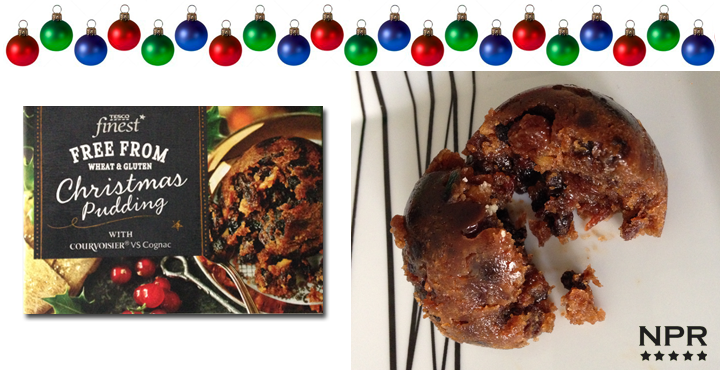 Small but packs a punch…literally with its added ingredients of Courvoisier Cognac and Sherry and unlike other Christmas puddings that can be a dry affair, this one is soft and moist and a joy to eat, you’ll definitely find space after your 2 plates of Turkey dinner on Christmas Day. Because of the generous portions of alcohol you can feel the warmth run down your chest as you eat your pudding well packed with sultanas, raisins and currants and another thing I like is that there isn’t too much nuts, in fact I found about one large pecan and a couple small pieces here and there. I’m not a big fan of Christmas puds and sometimes its a chore to eat them but I could have two of these no problem and actually enjoy it. I was visiting family in the U.K. At the end of November and found the Tesco Gluten Free Christmas Pudding while in Tesco’s. I was so excited to find a Christmas Pud that I could it that I bought it took it back to Canada so I could enjoy an old Christmas favourite. I was blown away! 10/10 all around. It was quick and easy just heating in the microwave for 70 seconds and even without custard, it was very moist, extremely flavourful, delicious so I savoured every bite ( It served two, but I had the whole pudding in one sitting!). You could really taste the liquor in the pud, which warmed me inside and out. The best before date was till March 2019… oh, why, oh why, didn’t I buy more!! !